J Goldstein, I Jaradeh, P Jhawar, T Stair. ED Drug-Drug Interactions: Frequency & Type, Potential & Actual, Triage & Discharge. The Internet Journal of Emergency and Intensive Care Medicine. 2004 Volume 8 Number 2. Study objective: We catalogued the most common medications and allergies in a large unselected emergency department population, and evaluated the frequency of potential drug-drug interactions in this cohort. Design and setting: This was a retrospective review of 1355 charts available from patient visits during a two-week period at a tertiary care university hospital. Measurements and main results: A total of 1435 potential and 14 actual drug interactions were identified from current medications recorded at triage, 30% of which were due to drug-drug interactions. There were an additional 450 potential and no actual interactions with drugs given or prescribed in the ED. The most frequent classes of medications implicated in potential drug-drug interactions were NSAIDs, beta-blockers, steroids, ACE inhibitors, and anticoagulants. Conclusions: A large percentage of patients presenting to the emergency department are already on a medication regimen with potential adverse effects, and this information is usually available at triage. Adverse drug reactions and drug interactions present a growing concern in the health care setting. A number of studies have found that the incidence of drug interactions ranges from 3%1 to 30%2. Drug-drug interactions can lead to a variety of adverse events, and it has been suggested that preventable adverse events are the eighth leading cause of death in the United States3. Adverse drug related events can take a number of forms, with drug-drug interactions one of the most common. A large number of drugs are available to the physician; the Food and Drug Administration has approved over 19,000 drugs, and an average of 340 new drugs are added to the formulary every year4. Many outpatients are on complex regimens of medication, and up to 20% report significant adverse events as a result of their medications5. A large retrospective study of 30,000 medical records in New York in 1984 found adverse events in 4% of hospitalizations6. Drug related complications caused 20% of these adverse events7. Adverse drug related events are largely preventable8, and it is critical to address barriers to their recognition and prevention. The task of recognizing drug interactions is somewhat more difficult in the emergency department, where every patient is new and unknown to the staff. The incidence of potential drug interactions in this patient population is high. A number of studies have estimated the incidence of potential drug-drug interactions in 20-30% of patients, and the incidence of clinically relevant interactions at 4-10%9,10,11,12,13,14. However, most studies have used a variety of screening criteria, and evaluate between 300-400 patients. The incidence of drug-drug interactions or adverse events in an unselected emergency department population is unclear. We are designing a computerized triage program which will allow patients to review their existing list of medications or choose their current medications from a list of 7000 medication names. In the background, it will check for interactions and then present a list of potential interactions to the emergency physician. This system should provide a critical resource to help improve the recognition of drug-drug interactions by emergency physicians. In order to focus our efforts on the most common medications and the most common drug-drug interactions to screen for, we attempted to evaluate the frequency and type of drug-drug interactions in our ED patients by screening records over a two week time period. This method resulted in a sample of 1355 patients, an order of magnitude greater than that in many of the studies cited above. 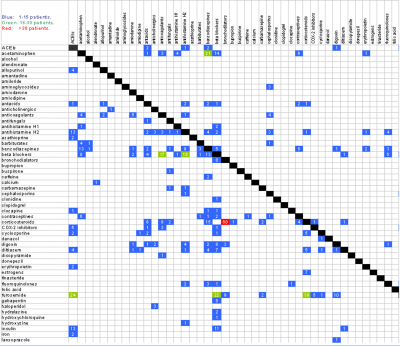 All medications were cross-compared using a computerized database of known drug interactions. This was a retrospective chart review. Carbon copies of all ED charts available from August 1-August 14, 2000 were abstracted. Medications that patients were taking were abstracted from the triage sheet, and compared with those on the physician section. A physician reviewer (JNG) reviewed charts for evidence of an adverse drug-related event. Finally, medications given in the ED and prescriptions written were documented. The study was conducted at Brigham and Women's Hospital, an urban-based tertiary care institution. The Institutional Review Board approved the study. The Medical Letter Drug Interaction Program, from The Medical Letter Inc, 1000 Main Street, New Rochelle, NY 10801-7537, generated drug-drug interactions. We chose this particular program because Beer16 also used it in his study. Data were entered and analyzed with Microsoft Access and Excel. 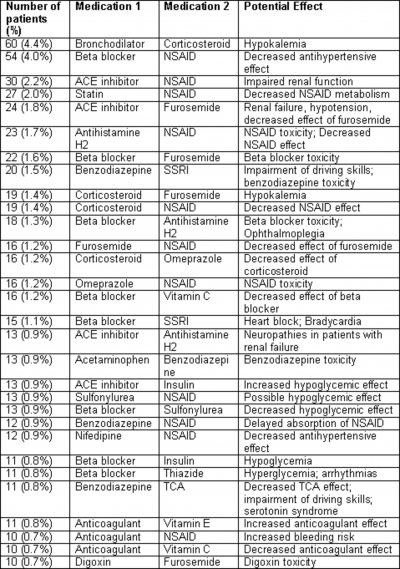 Table 1: The 20 most common medications reported. Table 2: Frequency of polypharmacy. The number and proportion of patients reporting multiple medications are listed. Table 3 lists drug allergies reported at triage and Table 4 the frequency of drug allergies, with 24% of patients reporting at least one medication allergy. Surprisingly, four patients reported they were currently taking drugs to which they claimed to be allergic. Two of these were aspirin, one was sulfamethoxazole, and one was penicillin. There were no documented instances of an adverse event related to a patient taking a medication to which they reported an allergy. Table 3: Allergies reported at triage. 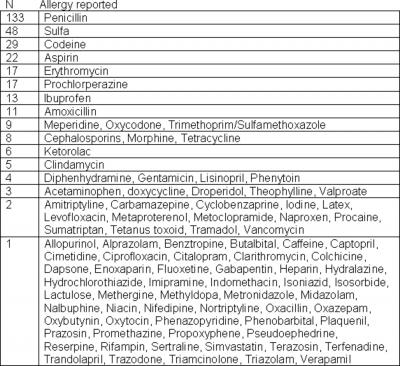 The number of patients with each medication allergy are listed. Table 4: Frequency of reported drug allergies. The number and proportion of patients listing multiple allergies are listed. Table 5 lists the most common medications given or prescribed in the ED and Table 6 the frequency of ED prescriptions. Most patients (72%) were given medication, and 2% received at least five new medications. In combination with the frequency of polypharmacy on presentation, this suggests a high risk of drug-drug interactions. Table 5: The most common ED prescriptions. 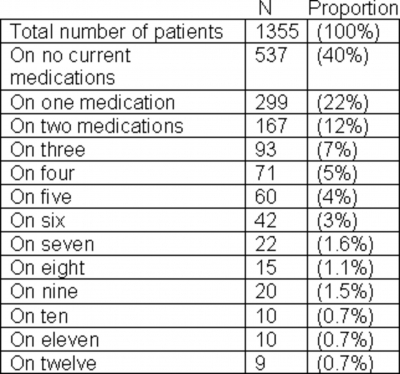 The number of patients given or prescribed each medication in the emergency department is listed. Table 6: Frequency of additional prescriptions from the emergency department. The number and proportion of patients receiving prescriptions in the ED are listed. 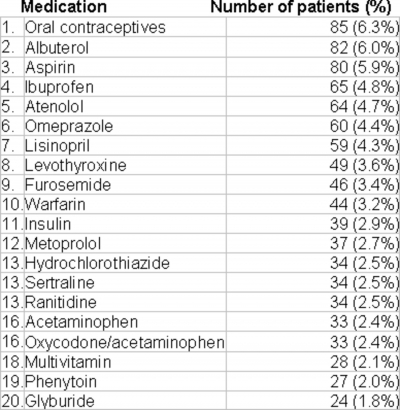 Table 7 lists the most common of the 1435 potential interactions of patients' current medications generated by the Medical Letter Drug Interactions Program. Some of these drug combinations are logical, such as a bronchodilator and a corticosteroid, or two antihypertensives, with potential interactions that are usually tolerated. Table 7: Most common potential interactions of current medications at triage. 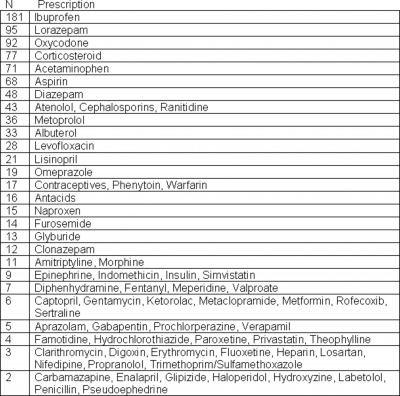 Table 8 lists the most common of the 450 potential interactions of medications prescribed in the ED. A full cross tabulation of frequencies is in Table 9, with current medications in the left lower half, and ED prescriptions in the right upper half. Table 9: Cross tabulation of frequencies of potential interactions. Current medications are listed along the lower left, and ED prescriptions are listed along the upper right. The number of patients with each interaction is listed in each box. The graph is color coded as follows: Blue, 1-15 patients; Green, 16-30 patients; Red, >30 patients. Table 10 summarizes the 14 notes in the 1355 ED charts suggesting a drug related adverse event. The most notable are increased bleeding from multiple anticoagulants; bradycardia from multiple rate control agents; and Dilantin toxicity from a Bactrim/Dilantin interaction. The number of adverse drug related events documented by emergency department caregivers was 14 out of 1355 visits, or approximately 1% of all ED visits. Five of these adverse drug related events (0.3% of all visits) were due to drug-drug interactions. Myelotarg causing death – An 84 year old male with leukemia expired after an acute reaction to this chemotherapeutic agent. Ibuprofen causing an allergic reaction – A 23 year old female developed swelling of her face and lips after taking ibuprofen – this was diagnosed as an allergic reaction. Gentamicin eye drops causing irritation – A 53 year old woman developed optic irritation in response to these drops. Neosynephrine nasal spray causing nasal irritation – A 42 year old male developed sinus pain after using neosynephrine for 10 days. Codeine causing nausea – A 26 year old female developed nausea and dizziness after taking codeine. She was discharged on Darvocet. Gabapentin (Neurontin) causing paresthesias – A 44 year old female with breast cancer and brain metastases presented with intermittent left hand numbness which she ascribed to neurontin use. Her neurontin dose was decreased. Erythromycin causing nausea – This 69 year old female developed nausea and vomiting after starting erythromycin for lymphadenitis. Her antibiotic was switched to cephalexin. Percocet causing nausea – This 20 year old female suffered nausea due to Percocet. She was given a prescription for Vicodin. Hydromorphone causing constipation – A 62 year old female presented for constipation 2 weeks after colostomy takedown. She was given colace, and her hydromorphone dose was cut in half. Oxcarbazepine (Trileptal)/Levetiracetam (Keppra) causing lethargy – An 80 year old male with a seizure history presented with lethargy and mental status change after his carbamazepine (Tegretol) was switched to oxcarbazepine. Enoxaparin/Warfarin causing bleeding – A 72 year old male developed gum bleeding on enoxaparin and warfarin. His enoxaparin was discontinued and his bleeding resolved. Lisinopril/furosemide (Lasix) causing renal failure and hyperkalemia – A 71 year old male developed renal failure and hyperkalemia which was attributed to his lisinopril. Potential contributors among his other medications include furosemide, atenolol, digoxin, amlodipine, and simvastatin. His lisinopril was discontinued, his other medications were maintained, and he did well as an outpatient. Trimethoprim/sulfamethoxazole (Bactrim) / Phenytoin (Dilantin) causing increased phenytoin levels – A 54 year old female developed lethargy while on dilantin, haloperidol, and bactrim, 3 weeks after a craniotomy for an aneurysm. This combination is known to increase phenytoin levels. Her dilantin level increased from 10.7 to 17.2 that day. Her antibiotic was switched to levofloxacin, and her dilantin levels progressively fell in the following days. Amiodarone /amlodipine (Norvasc) interaction causing bradycardia – This 77 year old male presented for somnolence. He was found to have a pulse of 44. He was in atrial fibrillation on coumadin, amiodarone, levoxyl, lipitor, amlodipine, and flomax. His amiodarone was cut in half on discharge. Drug related adverse events have been identified as a major source of morbidity and mortality in the United States, and drug-drug interactions are a significant source of these events. In this study, we documented the frequency of various reported medications and allergies in an unselected emergency department population. In addition, we calculated the frequency with which potential drug-drug interactions would be highlighted by a computer-based system that might screen patients at triage. The most common medications taken by our emergency department patients were oral contraceptives, albuterol, and aspirin. The frequency of polypharmacy is high in our ED population, with six percent of patients taking more than 7 medications. These frequencies are similar to those reported by other groups 14, 16. These patients are likely to be sicker, to have more medical problems, and to be at higher risk of drug-related interactions than the average patient10, 13, 14. 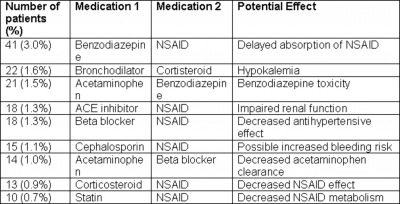 The most frequent classes of medications implicated in potential drug-drug interactions were NSAIDs, beta-blockers, steroids, ACE inhibitors, and anticoagulants. This compares similarly to a previous report which also implicated antibiotics, diuretics, hypoglycemics, and calcium-channel blockers12. In contrast, when only those interactions that were thought to be clinically relevant by emergency physicians are analyzed, antihypertensives (most commonly beta blockers) and carbamazepine are the most commonly cited.10 Our study and others recognize NSAIDs as the most common source of potential drug-drug interactions. Although many medications have been implicated in numerous studies as a source of potential interactions, it has been difficult to evaluate the frequency of clinically relevant adverse drug related events. Gandhi et al recently reported that in a series of ambulatory care patients, up to 25% suffered an adverse drug event, of which 13% were serious5. Our data suggest that only 1% of presentations to the emergency department can be primarily attributed to an adverse drug related event; however, these data can be reconciled by hypothesizing that only a small percent of patients with an adverse drug related event present to the emergency department rather than to their doctor's office. In the study by Gandhi et al, the most commonly implicated drugs causing an adverse event were selective serotonin reuptake inhibitors (SSRIs), antihypertensives, and NSAIDs. We similarly found that NSAIDs and antihypertensives were commonly implicated, but found a lower rate with SSRIs. This may again reflect the differences in populations. When controlling for frequency of use, Gandhi et al found that corticosteroids were the most common adverse event associated medication, while we found it to be one of the most common medications associated with potential interactions. The frequency of clinically significant adverse drug related events in this study was approximately 1%, as compared with the 10% documented by Hohl et al in 200112. One explanation for this difference is that Hohl et al prescreened for ED visits by patients 65 years of age and older, a group that has been shown to demonstrate a much higher risk of adverse drug related events. In addition, their criteria was quite broad and included patient noncompliance. Our study only documented adverse drug related events that were recognized as such by the treating clinician. The frequency of potential drug-drug interactions, however, was one hundred fold higher than that of documented adverse drug related events. Drug-drug interactions are known to comprise a small subset (3%-6%) of all adverse drug reactions7, 17, 18. Many of these drug interactions are known and expected, and include medications that are frequently used in concert (such as corticosteroids with albuterol). However, many are of potentially high relevance, and we noted four cases here in which a foreseeable drug-drug interaction led to a clinically significant adverse event requiring a presentation to the emergency department. Potential drug-drug interactions are present not only at triage, but are often compounded by medications given in the ED. Only 28% of out patients received no medications. The most common drugs given and prescribed in the ED, NSAIDs and benzodiazepines, are among the most common sources of potential interactions. Emergency physicians have been shown to demonstrate a poor sensitivity and specificity for drug-drug interactions compared to a computer system4, and a number of authors have suggested that computer-aided order entry and prescription writing can reduce the number of medication errors2, 3, 18,19,20,21,22,23,24,25,26. In our hospital, use of computerized order entry for inpatients, in which all medications are entered and cross-checked for interactions, has been shown to decrease medication errors and adverse drug related events18 and to generate cost savings as well.24 Our data suggest there may be a great deal of added value in translating a similar system to the emergency department. Our department has implemented a computer based order entry system,27 but this can only identify drug-drug interactions in those medications prescribed in the ED. In order to detect and screen for all medication interactions that may contribute to patient care, it may be appropriate that the triage nurse not only document all medications but also enter them along with allergies into the ED order entry system. While a number of potential interactions have been identified, not all are clinically relevant. It is important for expert systems to alert physicians only to the most important interactions, as they otherwise run the risk of showing too many alerts for the patients on multiple medications. We have documented the most common potential drug-drug interactions in an unselected emergency department population, which should help focus information systems development on highlighting the most common and most under-recognized drug-drug interactions. This study was retrospective and therefore analyzes documentation more than practice. Half the triage notes were missing, which was typical for our department at the time, and did not introduce any measurable systematic bias. In the cross tabulation of potential reactions generated by the Medical Letter Drug Interaction Advisor, we ignored combination products and interactions between two drugs in the same class, so these categories are under-represented in Table 9. Both triage notes and the interaction program ignored most complementary and alternative medications. The incidence of potential drug-drug interactions is high in an unselected emergency department population. The risk is higher among current medications recorded at triage than it is for new medications prescribed in the ED. Actual interactions are relatively few. Physicians should be vigilant for potential drug-drug interactions, especially among the most high risk patients taking multiple medications, but existing software that automatically alerts physicians to all potential interactions may generate excessive noise to signal. 1. Gosney M, Tallis R. Prescription of contraindicated and interacting drugs in elderly patients admitted to hospital. Lancet 1984; 2:564-7. 2. Kinney EL. Expert system detection of drug interactions: results in consecutive inpatients. Comput Biomed Res 1986; 19:462-7. 3. Kohn L, Corrigan J, Donaldson M. To err is human: Building a safer health system. Washington, DC: National Academy Press, 1999. 4. Langdorf MI, Fox JC, Marwah RS, Montague BJ, Hart MM. Physician versus computer knowledge of potential drug interactions in the emergency department. Acad Emerg Med 2000; 7:1321-9. 5. Gandhi TK, Weingart SN, Borus J, et al. Adverse drug events in ambulatory care. N Engl J Med 2003; 348:1556-64. 6. Brennan TA, Leape LL, Laird NM, et al. Incidence of adverse events and negligence in hospitalized patients. Results of the Harvard Medical Practice Study I. N Engl J Med 1991; 324:370-6. 7. Leape LL, Brennan TA, Laird N, et al. The nature of adverse events in hospitalized patients. Results of the Harvard Medical Practice Study II. N Engl J Med 1991; 324:377-84. 8. Bates DW, Boyle DL, Vander Vliet MB, Schneider J, Leape L. Relationship between medication errors and adverse drug events. J Gen Intern Med 1995; 10:199-205. 9. Karas S, Jr. The potential for drug interactions. Ann Emerg Med 1981; 10:627-30. 10. Herr RD, Caravati EM, Tyler LS, Iorg E, Linscott MS. Prospective evaluation of adverse drug interactions in the emergency department. Ann Emerg Med 1992; 21:1331-6. 11. Raschetti R, Morgutti M, Menniti-Ippolito F, et al. Suspected adverse drug events requiring emergency department visits or hospital admissions. Eur J Clin Pharmacol 1999; 54:959-63. 12. Hohl CM, Dankoff J, Colacone A, Afilalo M. Polypharmacy, adverse drug-related events, and potential adverse drug interactions in elderly patients presenting to an emergency department. Ann Emerg Med 2001; 38:666-71. 13. Gaddis GM, Holt TR, Woods M. Drug interactions in at-risk emergency department patients. Acad Emerg Med 2002; 9:1162-7. 14. Heininger-Rothbucher D, Bischinger S, Ulmer H, Pechlaner C, Speer G, Wiedermann CJ. Incidence and risk of potential adverse drug interactions in the emergency room. Resuscitation 2001; 49:283-8. 15. Centers for Disease Control. Self-reported asthma prevalence and control among adults--United States, 2001. MMWR Morb Mortal Wkly Rep 2003; 52:381-384. 16. Beers MH, Storrie M, Lee G. Potential adverse drug interactions in the emergency room. An issue in the quality of care. Ann Intern Med 1990; 112:61-4. 17. Leape LL, Bates DW, Cullen DJ, et al. Systems analysis of adverse drug events. ADE Prevention Study Group. Jama 1995; 274:35-43. 18. Bates DW, O'Neil AC, Boyle D, et al. Potential identifiability and preventability of adverse events using information systems. J Am Med Inform Assoc 1994; 1:404-11. 19. Armstrong EP. Electronic prescribing and monitoring are needed to improve drug use. Archives of Internal Medicine 2000; 160:2713-2714. 20. Bates DW, Leape LL, Cullen DJ, et al. Effect of computerized physician order entry and a team intervention on prevention of serious medication errors. JAMA 1998; 280:1311-1316. 21. Bates DW, Teich JM, Lee J, et al. The impact of computerized physician order entry on medication error prevention. JAMIA 1999; 6:313-321. 22. Dean B, Schachter M, Vincent C, Barber N. Causes of prescribing errors in hospital inpatients: a prospective study. Lancet 2002; 359:1373-8. 23. Dean B. Learning from prescribing errors. Qual Saf Health Care 2002; 11:258-60. 24. Teich JM, Merchia PR, Schmiz JL, Kuperman GJ, Spurr CD, Bates DW. Effects of computerized physician order entry on prescribing practices. Archives of Internal Medicine 2000; 160:2741-2747. 25. Stair TO, Howell JM. Effect on medical education of computerized physician order entry. Academic Medicine 1995; 70:543. 26. Schenkel S. Promoting patient safety and preventing medical error in emergency departments. Academic Emergency Medicine 2000; 7:1203-1222. 27. Stair TO. Effect of computerized order entry on emergency physician time. Ann Emerg Med 2001; 38:S103. Joshua N. Goldstein, M.D., Ph.D.